Herington was named after its founder, Monroe Davis Herington. His name at birth was Davis Monroe Herrington, but he later dropped the second "r" from his last name. The first post office in Herrington was established in February 1884. The Chicago, Kansas and Nebraska Railway was foreclosed in 1891 and was taken over by Chicago, Rock Island and Pacific Railway, which shut down in 1980 and reorganized as Oklahoma, Kansas and Texas Railroad, merged in 1988 with Missouri Pacific Railroad, merged in 1997 with Union Pacific Railroad. Most locals still refer to this railroad as the "Rock Island". The National Old Trails Road, also known as the Ocean-to-Ocean Highway, was established in 1912, and was routed through Herington, Delavan, Council Grove. The American Discovery Trail passes through Herington. In World War II, Herington Army Airfield was built and was one of only two fields that processed heavy bombardment crews and equipment staging to the coasts for overseas duty. The field was later turned over to the City of Herington and is currently used as a municipal airport. According to the United States Census Bureau, the city has a total area of 5.09 square miles (13.18 km2), of which, 5.06 square miles (13.11 km2) is land and 0.03 square miles (0.08 km2) is water. The Kansas Historical Marker of Dwight David Eisenhower is approximately 1 mi (1.6 km) south of Herington. In 2012, the Eisnhower maker replaced the previous "Father Juan De Padilla And Quivira" marker. As of the census of 2010, there were 2,526 people, 1,082 households, and 666 families residing in the city. The population density was 499.2 inhabitants per square mile (192.7/km2). There were 1,300 housing units at an average density of 256.9 per square mile (99.2/km2). The racial makeup of the city was 93.3% White, 0.4% African American, 0.9% Native American, 0.5% Asian, 0.2% Pacific Islander, 1.7% from other races, and 2.9% from two or more races. Hispanic or Latino of any race were 5.7% of the population. As of the census of 2000, there were 2,563 people, 1,126 households, and 669 families residing in the city. The population density was 1,206.9 people per square mile (466.8/km²). There were 1,305 housing units at an average density of 614.5 per square mile (237.7/km²). The racial makeup of the city was 95.8% White, 0.6% African American, 0.4% Native American, 0.5% Asian, <0.1% Pacific Islander, 1.6% from other races, and 1.0% from two or more races. Hispanic or Latino of any race were 4.5% of the population. There were 1,126 households out of which 26.6% had children under the age of 18 living with them, 47.2% were married couples living together, 8.9% had a female householder with no husband present, and 40.5% were non-families. 36.9% of all households were made up of individuals and 19.9% had someone living alone who was 65 years of age or older. The average household size was 2.21 and the average family size was 2.88. In the city, the population was spread out with 24.0% under the age of 18, 7.0% from 18 to 24, 25.0% from 25 to 44, 20.1% from 45 to 64, and 24.0% who were 65 years of age or older. The median age was 41 years. For every 100 females, there were 88.7 males. For every 100 females age 18 and over, there were 83.7 males. The median income for a household in the city was $28,333, and the median income for a family was $36,696. Males had a median income of $28,359 versus $15,515 for females. The per capita income for the city was $16,526. About 6.2% of families and 8.2% of the population were below the poverty line, including 10.0% of those under age 18 and 7.6% of those age 65 or over. The Herington government consists of a mayor and four council members. Herington is part of Unified School District 487. The high school is a member of T.E.E.N., a shared video teaching network between five area high schools. From its beginnings, Herington has been a hub for the Rock Island, the Cotton Belt Route, Southern Pacific, and currently Union Pacific Railroad. UP still uses this as its hub on its system to this day. Herington has also been served by the Rio Grande, Missouri Pacific, and the Oklahoma, Kansas and Texas Railroad. ICAO:KHRU, located east of Herington. The Herington Public Library is a Carnegie library. 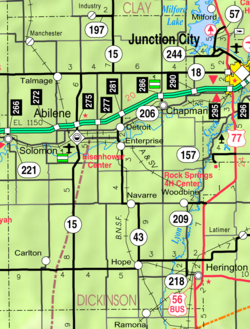 ^ a b c d Geographic Names Information System (GNIS) details for Herington, Kansas; United States Geological Survey (USGS); October 13, 1978. Wikimedia Commons has media related to Herington, Kansas.